Now caring for your dog's beautiful coat is easier than ever! We have bundled our best selling items for Australian Shepherd owners in one simple package! Each item is hand picked by an award Winning Certified Master Groomer, perfect for your BREED! 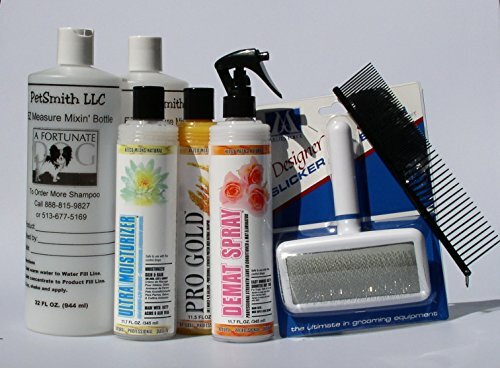 Here's what you will receive: 11.7 oz Kelco Premium Formula concentrate Shampoo; 11.7 oz Kelco Premium Formula concentrate Conditioner; 11.7 oz Ready to Use Finishing Spray; Karla's FAVORITE Brush and Comb, chosen with your pet's grooming needs in mind! The concentrated formulas are a great value! BUY NOW and we will include 2 FREE Measure Mixin' Bottles a $9.98 VALUE~ Yours FREE!! You will LOVE the show dog results at this unbeatable price! Your Australian Shepherd will Look & Feel Awesome!